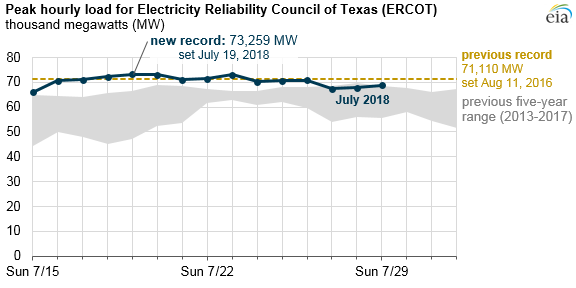 On July 18, 2018, electricity demand in the area served by the Electricity Reliability Council of Texas (ERCOT) reached a new all-time hourly peak load of 72,192 megawatts (MW) during the hour starting at 4:00 p.m. That record was itself surpassed the following day during the hour starting at 5:00 p.m., with load reaching 73,259 MW. The previous record of 71,110 MW occurred on August 11, 2016. Despite some sporadic power outages, ERCOT managed this new record demand without any widespread loss of load to the system. 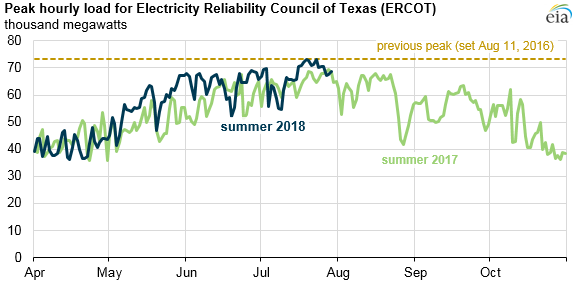 In its seasonal assessment earlier this year, ERCOT had expected that it would surpass its all-time daily peak load this summer, but at a slightly lower magnitude. While the assessment projected a new peak of 1,600 MW higher than the previous record set in 2016, the actual load record set on July 19 was approximately 2,100 MW higher than the 2016 peak. Recent coal power plant retirements and increased summer electricity demand have reduced the current reserve margin in ERCOT. This summer, ERCOT estimated a reserve margin of 10.9% of peak demand, which is lower than the planned reserve margin for ERCOT of 13.8%, and lower than the 15% reserve margin recommended by the North American Electric Reliability Corporation (NERC) for systems that predominately use thermal generation, such as ERCOT. Reserve margins reflect the amount of excess available generating capacity as a percentage of total capacity at projected peak system demand. Many wholesale markets operate a capacity market to encourage investment in generation resources and ensure adequate reserves. ERCOT does not have a centralized capacity market, but instead employs a mechanism to increase the wholesale electricity price during hours when available reserves are approaching critically low levels. During higher-than-usual real-time prices, ERCOT engages in a variety of demand response programs, which encourage residential and commercial customers to reduce their load during peak demand events in exchange for a credit on their electricity bill. ERCOT allows wholesale prices to rise relative to increases in demand, up to a price cap of $9,000 per megawatthour (MWh). 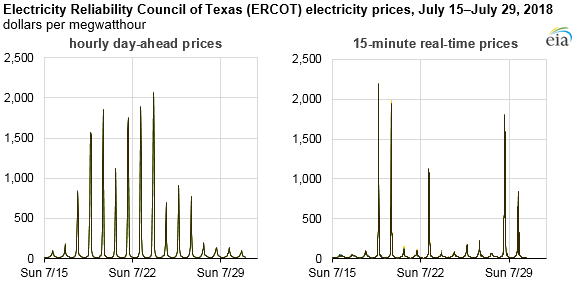 Day-ahead wholesale prices in ERCOT reached close to $2,000/MWh on the days of record-high peak loads in July. During the initial peak load event on July 18, real-time prices peaked at approximately $2,160/MWh. During the subsequent peak load event on July 19, real-time prices peaked at approximately $1,888/MWh.